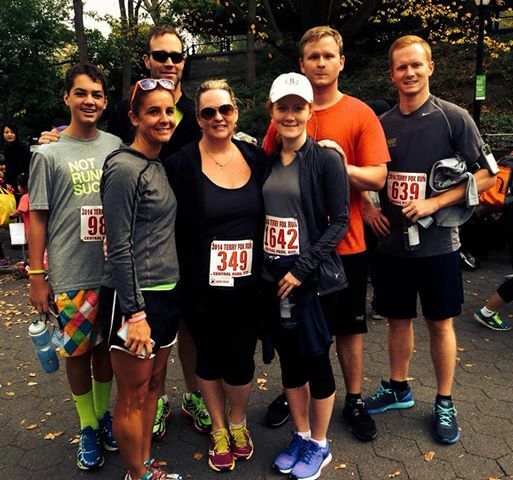 This past Saturday was the Terry Fox 5K race in Central Park. Our student Zach wanted to try out a 5K for the first time and we all thought this would be a good one for him. One of the first friends I met here in New York City 12 years ago has been doing this race for awhile and highly recommended signing up. Heather is one of nicest and most fun people ever, so it was an added incentive to see her too. Crazy fact; I have lived in New York City off and on for over 12 years now and never run a single race in the actual city. I have done so many races in Connecticut, New Jersey, and all over Upstate New York. So this was actually a first for me too. The race started right smack in the middle of Central Park by the Bethesda Fountain. We had signed up online and packet pick up was the hour before the race began. Registration was free with the offer of making a donation on behalf of the Terry Fox Foundation. Unbelievably we each received T-shirts with our bibs the morning of the race. 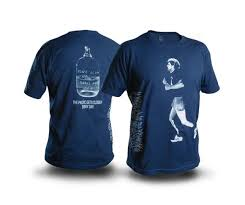 The shirts are you standard cotton T-shirt but the front is a really neat picture of Terry Fox. Terry Fox was a Canadian athlete who was diagnosed with cancer. In 1980, with one leg amputated due to his cancer, he went on to start a cross country running journey to help raise money and awareness for cancer research. His journey was called the Marathon of Hope. He made it to Thunder Bay, Ontario where he had to cut short his journey due to his illness and passed away nine months later. Today the Terry Fox Foundation is huge both in Canada as well as the United States. Races are run in his honor each year all over the country to help spread his legacy and continue his humanitarian efforts for cancer research. This was my first run back after the marathon and was glad to take it nice and easy with our buddy Zach and his friend Raphael. 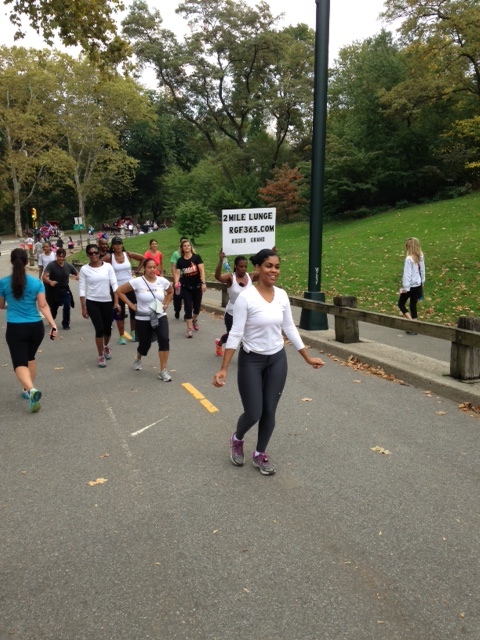 I followed them as they took off on their first 5K, two laps of the lower loop of Central Park. This was a nice easy one for these two who are already accomplished half marathoners at the old age of thirteen. It was well directed and boasted over 3000 runners! My husband’s depiction of the race to our preschool sports class yesterday. Pretty accurate. There were plenty of aid stations for a 5K (hosted by the Harlem Rangers youth hockey team) as well as plenty of cheer stations full of volunteers along the course. The Park can be crowded this time of year as athletes are winding down their marathon training along with lots of tourists and horse drawn carriages blocking the paths. The volunteers did a great job with crowd control. I crossed the finish right behind two sweaty but very happy young boys. There weren’t any medals to be given out but the Terry Fox 5K did not disappoint. There were tents full of food and refreshments, emcees chatting it up with the crowd and some really incredible raffle prizes. The Four Seasons Hotel made for one awesome sponsor for this race. Free trip to Orlando or brunch at the Four Seasons? That’s a nice incentive to wake up and run a few miles. The best part of the day, besides Zach winning one of the raffles, was that despite this being a free race they pulled in over $130,000 in donations. Now that is a serious success! 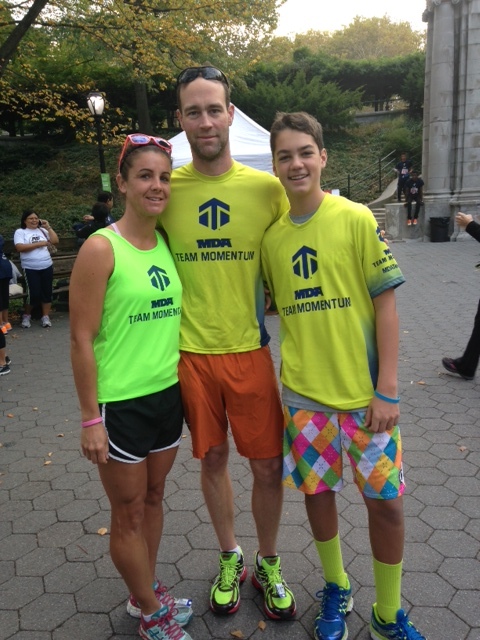 Congrats to Zach, Raph, and my friend Heather for running a great race for a great cause on Saturday. By the way, if you are missing that achy post race feeling in your quads and hamstrings we came across the perfect solution for you. As we were leaving the park there was a group doing a two mile lunge adventure. My husband ran up to take their picture and they offered to let him join. He decided last weeks 26.2 was enough damage on the legs for time being. I love charity running., It really just makes you thankful and greatful for everything that you have. And Rock’s drawing is amazing. I was definitely welling up with tears when we were waiting around. To see so many people out running for this great cause as well as the hundreds of volunteers was just incredible. 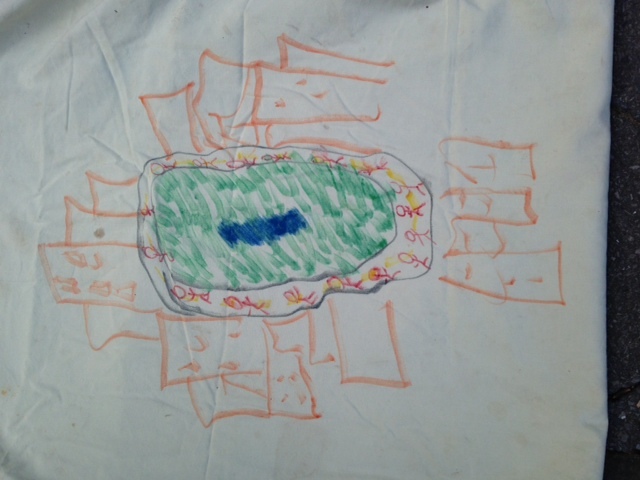 And yes, my husband is quite the artist isn’t he? Terry Fox us my hero and was born in my hometown of Winnipeg, Canada. Every time I am in Ottawa, Canada, I make a point of running by his statue and taking a moment or two of respect for him! That is awesome. I find his story to be so inspirational. In fact I’ve got goosebumps just hearing your story! Sounds like a great run and a great cause! Very cool! That’s a lot of skrilla they raised.I can’t believe you hadn’t raced in the city before. Crazy! Now that my friend has moved there and offered a free place to stay, I’m going to eyeball some NYC races! Looks great! 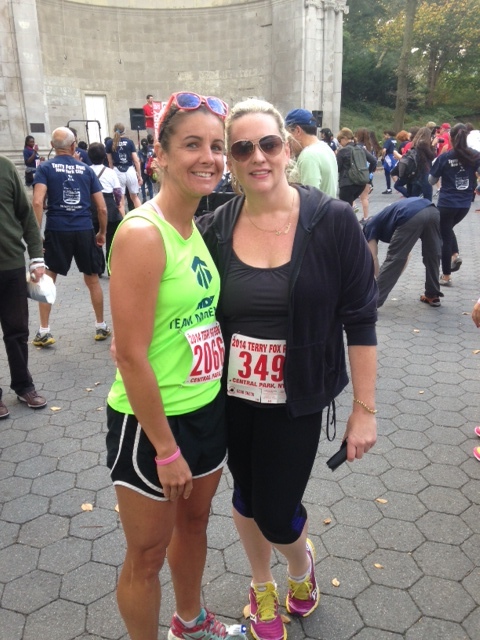 Crazy that you hadn’t ran in NYC before! Great start on racing in the city! I love the Terry Fox story and effort – I’d love to do a 5k! I’m so close to the border, I need to find one close to me!